West Leas Farm01765 658416work Self-cateringWest Leas Farm offers you a warm welcome. Set amidst the beautiful North Yorkshire countryside they all look out onto open fields and a lake in the valley bottom. The farm being up a short lane is quiet – but not isolated nearby village just a mile away and Ripon or Masham only 5 miles away. In Ripon explore the Cathedral or visit Fountains Abbey. The Yorkshire Dales on one side and the North York Moors on the other you can explore the many castles, waterfalls or pretty villages that are within a short distance. The Byre offers 1 double bedroom, 1 twin bedded room, both with exposed beams and stone features ,Luxurious bathroom with shower , large lounge/diner, well-equipped kitchen, front courtyard with parking, rear garden with patio and gate leading to open fields and views over open valley. Fold-out bed available. Granary Cottage offers 1 double plus a fold-up child's bed or cot, bathroom with shower cubicle, open plan dining room & lounge and fully fitted kitchen area, rear patio area/garden with gate leading to open fields. 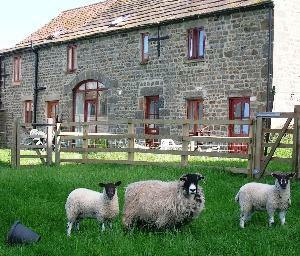 West Leas Farm limits bookings to 2 or more days.